The picture of the week is “Colonial residence, Raleigh, NC built by Joel Lane. 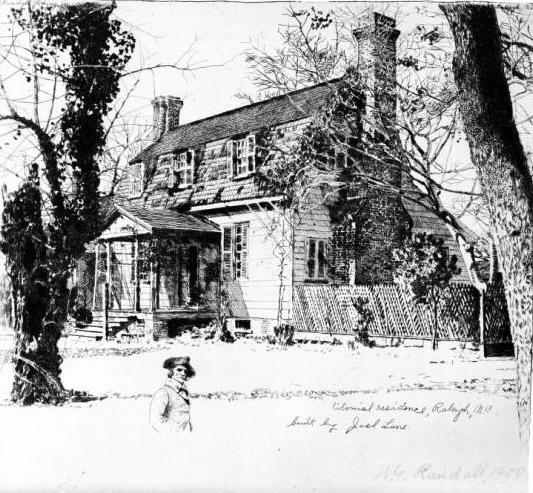 The drawing is an ink and pencil sketch of the Joel Lane house drawn by William Randall in 1900. The drawing depicts what the house may have looked like in the 1700s. The drawing also features a likeness of Joel Lane wearing a three-corner hat, a pea coat, and smoking on a pipe. « Are you a North Carolina Librarian?